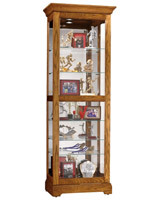 This Display Cabinet Is Almost 85" High and Features Pad Lock Lights! 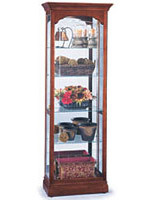 This Display Cabinet Is a Display Case with Glass Doors, Glass Shelves, and Cherry Wood Frame! 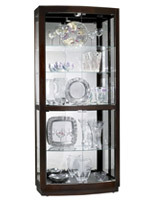 This Display Cabinet Is in Stock and Ready to Ship! A No-Reach? 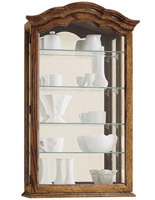 light located on the wood cabinet back to provide easy access to lighting. 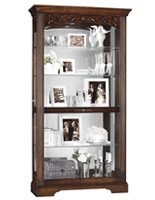 A traditional hinged, locking door to provide easy access to, as well as security of, your collectibles. 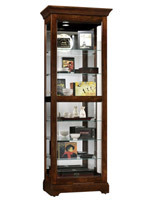 Fully adjustable glass shelving with Pad-Lock? cushioned metal shelf clips for added stability. 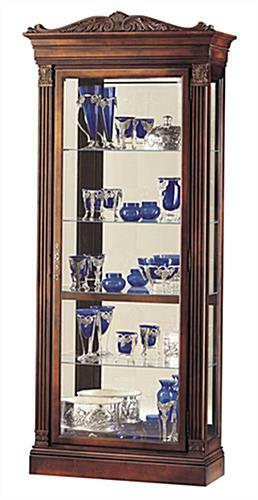 Beveled front glass for an elegant way to frame your valuables. Interior halogen lighting for a whiter, brighter, more natural way to showcase your items. A warm Embassy Cherry finish. 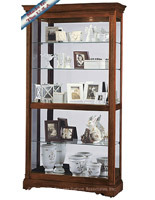 This display cabinet furnishes buyers with a uncomplicated and elegant means of exhibiting prized collectibles. 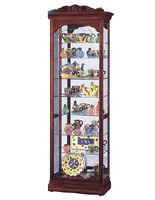 Detailed and intricate wood molding with a scallop shell center adorns the top of this display cabinet. 37.0" x 84.8" x 14.5"